Visits: 25293 persons viewed this recipe. 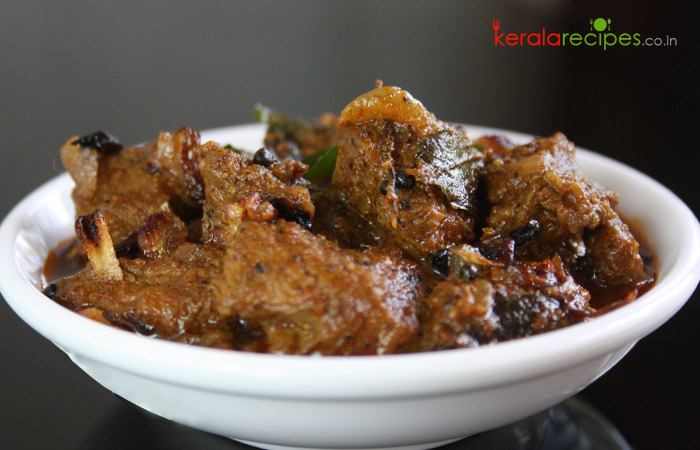 Kerala beef fry – an inevitable dish in “kallushap” (toddy shops in Kerala). Most wanted dish because of its highly spicy and stimulating taste. Those served in “kallushap” is very spicy but here we prepare it in a tolerant level. Anyway adjust the spices according to your taste. Slice shallots. Chop ginger and garlic. Pressure cook beef along with coriander powder, chilli powder, turmeric powder and salt. When you hear the first whistle, reduce the flame to low and wait for the second whistle. Turn of the fire and let the pressure settle. When the pressure settles, open the lid and heat until it is almost dry. Heat 3 table spoon of ghee in a cooking pan and put mustard seeds. When the mustard seeds begin to sputter, reduce the flame to medium. Put thinly sliced coconut pieces and fry it for 2 minute (optional). Add garlic, ginger, shallots and curry leaves one by one. Saute it by adding a little salt. When it turns golden brown, put 1 table spoon of meat masala and stir it for 1 minute. Now, add cooked beef into it and mix it well. Heat until it is dry (stir occasionally). When it becomes dry put 1 tea spoon of black pepper powder and combine it well. Taste for salt. Kerala beef fry is ready for serving. Transfer to the serving dish. Garnish it with coriander leaves and onion slices (if required). Tried this once. Tasted great. You are welcome Vimal. Great to know that you enjoyed it. Thanks for taking time to share your feedback. Wonder full recipe. Thanks for posting keralarecipes. You are welcome Abdul Rasheed, Thanks for the nice words. Good work Shaan. I have a suggestion. Add 2-3 green chilly slices also in step 7. Its better. Kishore, Thanks for the tip. If you want more spicy beef fry you can definitely add it. Very good job. Wonderfull spicy recipe. I like very much, thank u! Tasty dish. Simple to prepare. Thanks Shaan. Can you give a tip for butter chicken. You are welcome Krishna Kumar. I will try to include the butter chicken recipe. Thanks for the feedback. Great taste… I love your recipes. Thanks a lot. Saleem, Thanks for the great words of encouragement. Shaan… tried it out.. came out fantastic. thanks. pls add more chicken spicy dishes. Hi Shan, I tried it out, nice website. Wow so simple, I tried it. It was really tasty. I added 2 tomatoes too. It is delicious.